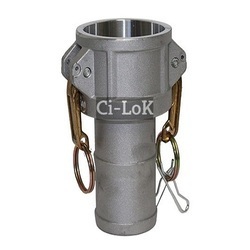 Leading Manufacturer of type - e camlock hose adapter, camlock coupler, type - a camlock female adapter, type - c camlock hose coupling, type - d camlock female coupling and type - f camlock male adapter from Mumbai. Thread Size 1/8" to 6"
Type E adapters are generally used with the same size Type C couplers, however, Type B and D couplers are compatible, as well as the DC (Dust Cap). 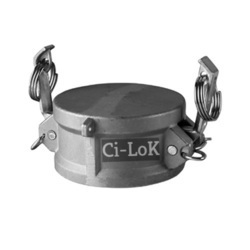 Camlock Coupling offered comes in quality construction finish and can be made available in different configuration choices as per the specific demands of the customers. 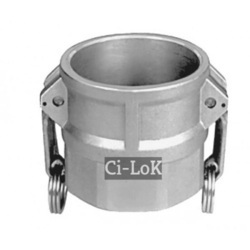 As leading names in field of Camlock Couplings, we ensure these provide for quick, tight leak proof connection support to pipes and hoses. 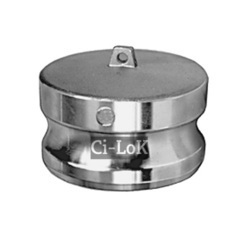 Type A adapters are generally used with the same size Type D couplers, however, Type B and C couplers are compatible, as well as the DC (Dust Cap). Thread Size (inch) 1/8" to 6"
Type C couplers are generally used with the same size Type E adapters, however, Type A and F adapters are compatible, as well as the DP (Dust Plug). Type D couplers are generally used with the same size Type A adapters, however, Type E and F adapters are compatible, as well as the DP (Dust Plug). Type F adapters are generally used with the same size Type B couplers, however, Type C and D Couplers are compatible, as well as the DC (Dust Cap). To cap the end of a connection, Dust Caps (DC) can be used with either Type A, E or F adapters. 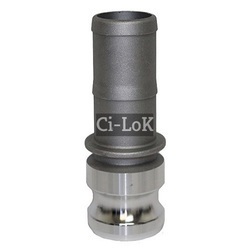 Thread Size 1/8" to 8"
Camlock Dust Plug can be used with type B, C and D couplers to seal the end of the connection. 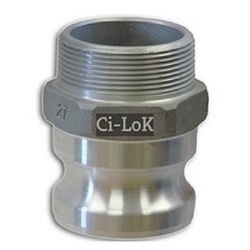 We are offering Camlock Hose Insert to our clients. We also export world wide. Type B couplers are generally used with the same size Type F adapters, however, Type A and E adapters are compatible, as well as the DP (Dust Plug).